A Day of Learning strives to gather a group of people to share their personal knowledge and experiences. With this idea in mind, The Grand Feast was conceived to bring together strangers of various cultural background to share their personal experience through the act of making an ideal food together, more specifically, the dumpling. Food can be seen as a tool to gather people in many cultures, and it transcends any language or communication barriers in many cases. Food is an intuitive medium to experience, which does not need education or language to experience and taste, but our own instinct. The main reason why the dumpling was specifically chosen as a dish for this social experiment is that it exists in various cultures around the world in diverse forms, for example, the Italian ravioli, the Chinese jiaozi, the Turkish manti, the Maltese ravjul, the Russian pelmeni, the Ukrainian vareniki, the Polish pierogi, the Korean mandu, the Japanese gyoza, and so much more! It may as well be considered a universal dish with symbolic meanings and implications. Being Chinese, the dumplings in this part of my culture is believed to bring prosperity, and therefore, it is consumed during auspicious gatherings such as Chinese New Year Eve. For many, it might also be considered a comfort food and a remedy of homesickness. It is a dish with cultural common ground. On Saturday 16th September, the first edition of The Grand Feast took place in Delfshaven, which is a very diverse neighbourhood in Rotterdam, with the help of the local community centre, Stichting Schiezicht who provided the space for the event as well as helping hands. 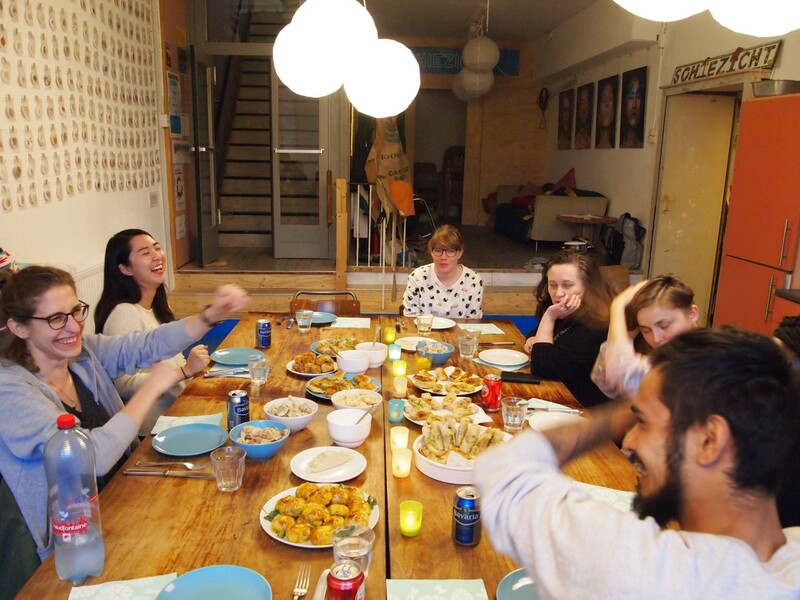 The event gathered six participants and a few volunteers from a variety of cultural backgrounds such as Ukrainian, Greek, Korean/New Zealander, French, and Dutch, of multiple and intersectional identities. The participants were paired up into teams beforehand under two conditions: the first was that they mustn’t have known each other before the event, the latter was that they must be of different backgrounds and origins. 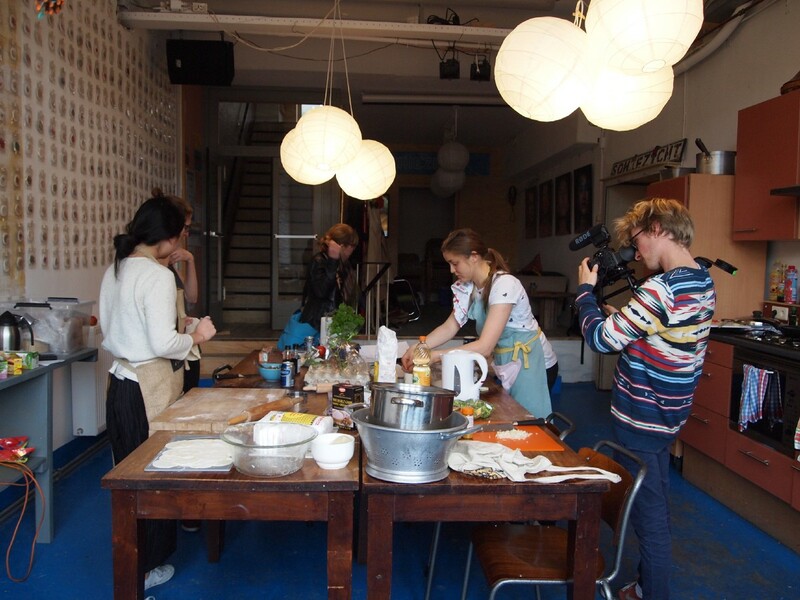 The pairs were then introduced and were asked to discuss the typical flavours and ingredients of their own cultures and how they could incorporate them into a new recipe towards an ideal dumpling, merging the different flavours together. Numerous inspiring ideas emerged, and the teams set out to source the ingredients from the local area. Each pair was given a budget of 20 euros. Stichting Schiezicht was strategically chosen for its vicinity, as there are a variety of shops closely. Nearby, a fresh market takes place every Saturday, alongside local businesses that specialise in Surinamese, Polish, and Turkish food products as well as major chain supermarkets. The workspace was set up with a large table in the middle of the space, allowing the participants to gather around. The setting remained the same throughout the day, however, the functionality of the table transformed. 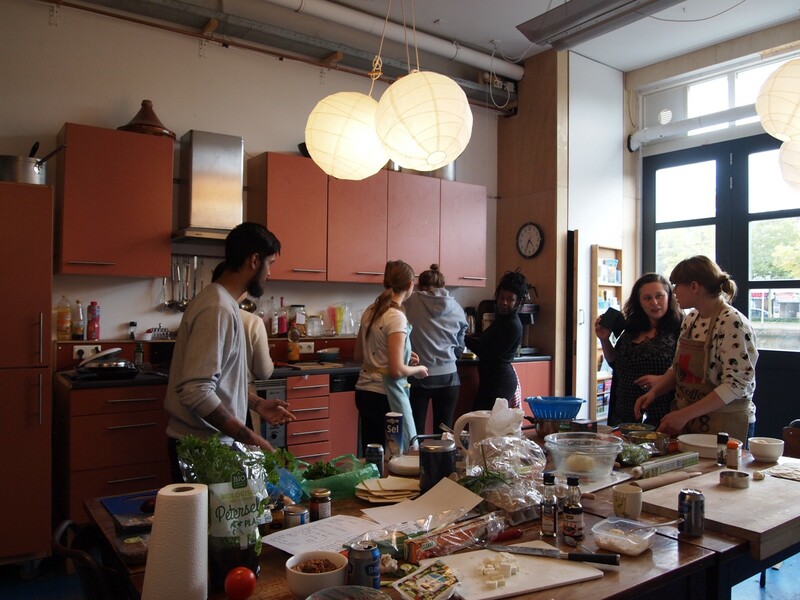 For example, during the cooking session, the table was adapted into workstations, where each team could work alongside each other and observe and be inspired from their neighbours. This also allowed the participants to communicate and even help one another individually and as teams, fostering another layer of casual engagement and learning. 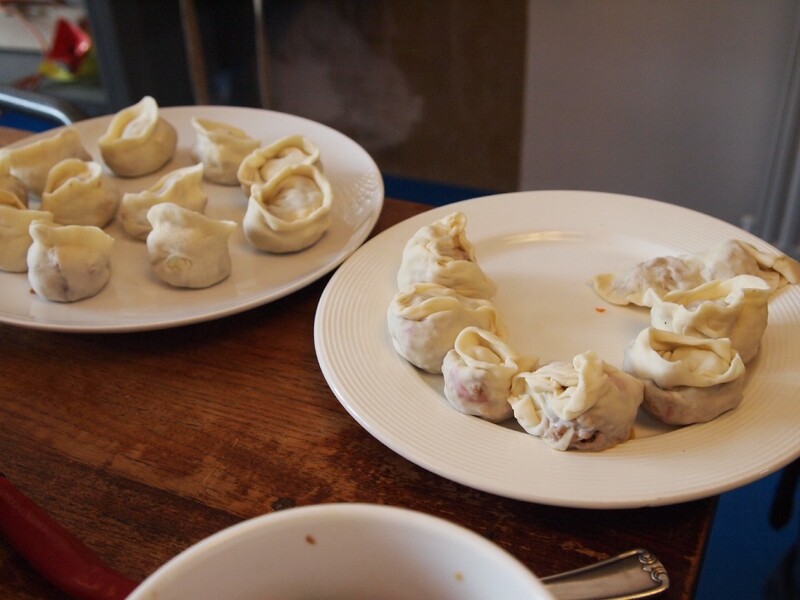 The participants were encouraged to improvise with the available ingredients, and they were free to reinvent and reinterpret the different elements that make the dumpling — the dough, the filling, the cooking methods, the condiments etc, with the help and advises from a professional cook. 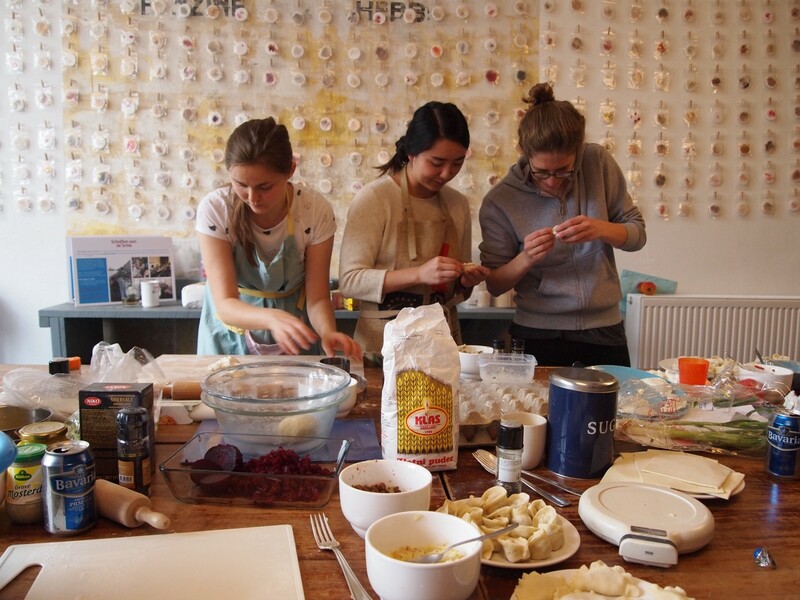 As a result, some very exciting hybrids emerged from the exchange, for example, the Korean-Greek feta and beef bulgogi dumplings, the Dutch stampot loempias, the Dutch-Indonesian-French vegetarian rendang and mozzarella puffs, the Ukrainian-Dutch chocolate and beetroot varenikis and many more. There was a great diversity and common ground among such a simple and mundane dish like the dumpling. The dishes were then shared around the table for dinner, which concluded the day as The Grand Feast. Taking into consideration on the purpose of sharing and gathering, The Grand Feast as A Day of Learning did not involve a strict division between the roles of teachers and students, since everybody learned from each other consciously and sub-consciously by working together. In this case, the roles were fluid and all participants acted as students and teachers throughout the day, with one keyword to keep in mind: the ideal and taking advantage of the context and making the best out of the situation. Additionally, several circumstances had led to a diversion from the original plans, resulting in a change in focus groups and collaborations, however, the concept of exchanging and creating a new ideal hybrid together remained. One major lesson I learned as the project initiator is that although thorough planning had been made and scenarios imagined, some unforeseeable event might occur without anticipation. Therefore, it is essential to sometimes let go of control and be spontaneous to make quick decisions and be open to change in order to achieve a successful feast, the ideal situation. In the end of the day, there is still much to be learned and spaces for new experiments. The Grand Feast was a great success with new friendship and relationships being born from the day together. After all, this project is merely a small beginning of a larger movement in the future.